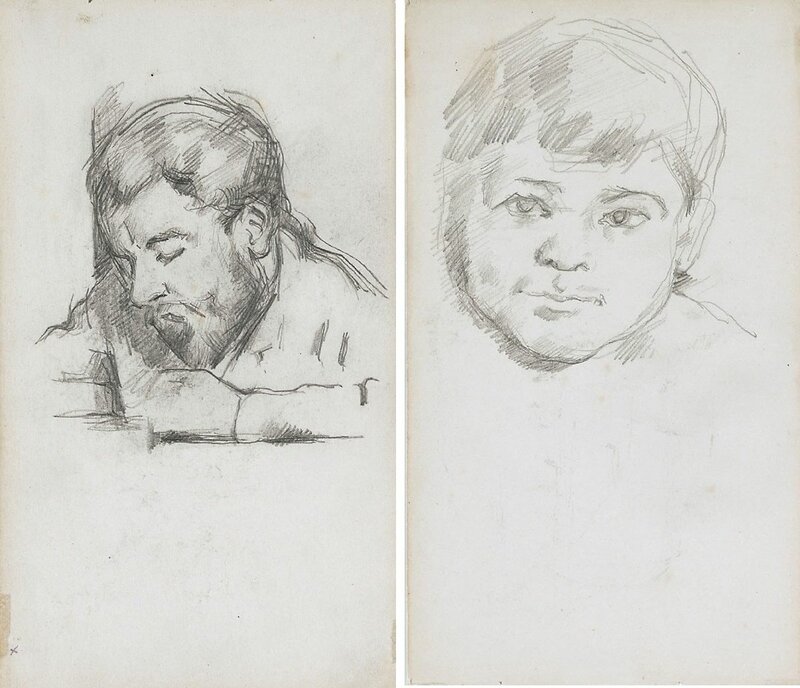 This double-sided sheet – like most of Cézanne’s thousand- plus drawings – was originally part of a sketchbook. It belonged to the artist’s son, Paul Cézanne fils, then to the dealer Paul Guillaume, before being acquired and dismantled in the 1930s by the art historian Adrien Chappuis. Chappuis began purchasing Cézanne drawings in the 1920s and devoted his life’s work to their study, the culmination of which was the catalogue raisonné he published in 1973. Chappuis maintained that Cézanne’s drawings could be best appreciated when presented individually, and he felt no compunction about removing pages from sketchbooks. Indeed, the process of disbanding the sketchbooks had been started by Paul fils and his mother when they inherited them. It was almost certainly at this time that individual pages were discreetly numbered in order to keep a record of the sketchbooks’ contents and order. Of the 18 sketchbooks thought by Chappuis to have survived in the artist’s estate, only seven remain intact, and then only partially so. The activity of drawing was necessarily a private one for Cézanne. None of his drawings were exhibited during his lifetime. 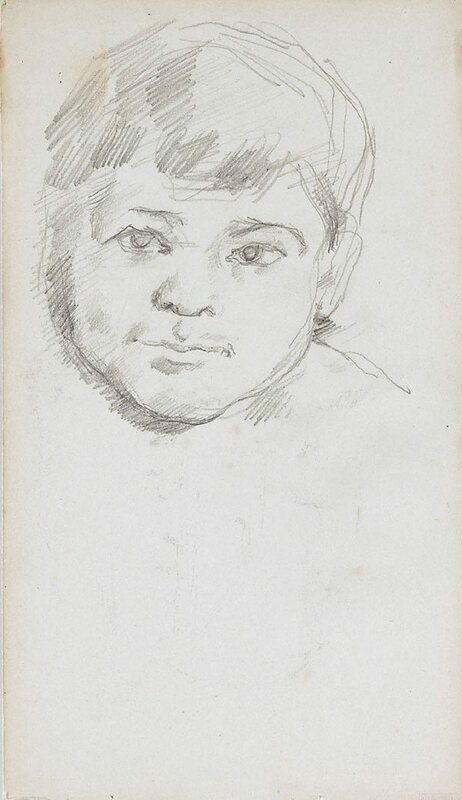 His sketchbooks are filled with informal and intimate glimpses of corners of his studio, studies after the old masters (especially sculptures), portraits of his family and close friends, and transcriptions of landscape using the horizontal orientation of a given page. Cézanne paid scant attention to order and system in his sketchbooks, preferring to jot down whatever pleased him on an empty page, so that it is not uncommon to find drawings facing each other that appear to date from distinctly different periods. 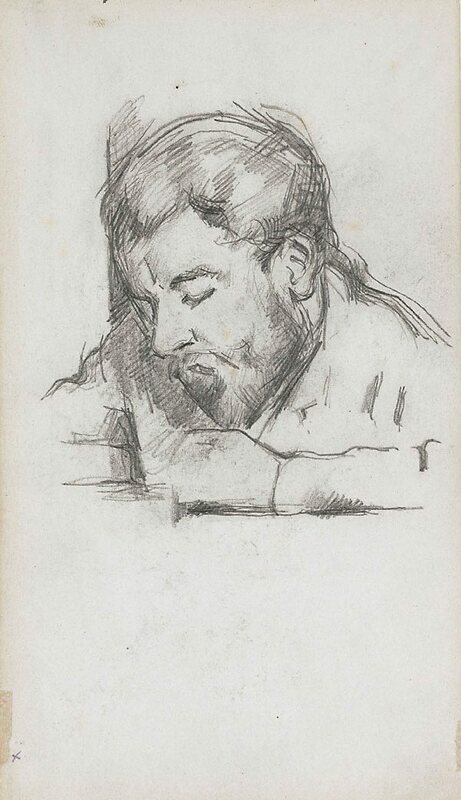 Of the two portraits featured on the Gallery’s sheet, the drawing of Émile Zola, shown absorbed in thought, sitting at his desk, is the slightly later one in date, executed during one of Cézanne’s regular visits to the great writer’s house. The close friendship between Zola and Cézanne originated during their schooldays in Aix-en-Provence. When Zola departed for Paris in 1858, Cézanne planned to join him there, and they maintained contact with each other through a correspondence in which they shared their ambitions and experiences. Following the publication in 1877 of his novel L’Assommoir – a study of working-class alcoholism and his most realistic novel to date – Zola became the most famous living novelist in France. With the huge success of this work he bought a luxurious house at Médan, on the banks of the Seine near Paris. Cézanne visited the novelist several times between 1879 and 1885, and made a number of sober and intense pencil sketches of him. Relations between the two men had become increasingly delicate, however, and the rift between them would be complete after Zola’s fictional transformation of Cézanne into Claude Lantier, the artist of failed artistic genius driven to suicide who was the protagonist of his novel L’Œuvre (1886). To what extent Cézanne detected himself in the character of Lantier is not known, but after this time the old friends never saw each other again. Ceding niceties of draughtsmanship and concern for anatomical correctness, the Gallery’s drawing shows Cézanne’s predisposition to frame and position the sitter according to a rigorous, quasi-geometric, formal arrangement. The spatial context is merely suggested by the vertical band on the right – seemingly wedging the subject into a corner – and the hatched shadows beneath the writer’s radically simplified left hand and arm. The drawing on the verso presents a marked contrast. It depicts the open-faced, luminous gaze of a young boy. The sitter is Cézanne’s son, Paul, a favourite subject of his doting father. His mother, Marie-Hortense Fiquet, first met Cézanne in Paris in 1869. Their son was born in 1872 and they finally married in 1886, although they lived apart for long periods. There are more than 100 studies documenting the growth of the boy from infancy to adolescence, which communicate Cézanne’s joy before his son. Little Paul is here depicted probably between the ages of eight and ten. J. Adhémar, Gazette des Beaux-Arts , 'Le cabinet de travail de Zola', Paris, Jul 1960, p 285. T. Reff, The Burlington Magazine , 'Cézanne drawings 1875-85', London, May 1959, p 176. Prints & drawings Europe 1500-1900 , Sydney, 2014, p 170, col illus p 171.